Currently viewing the tag: "incandescent"
I’ve been much more interested in reducing energy, saving electricity and improving energy efficiency in homes from the moment I first heard Amory Lovins speak at the Defense Acquisition University (DAU) in the mid 2000’s. From his inspiration I started reviewing my own life and focused its energy expenditures. I started with household light bulbs. In the pursuit to reduce our home electricity use and save on electricity and utility costs I immediately purchased numerous CFLs and started ensuring the old incandescent bulbs were removed and replaced. What I found was that I was on the early end of the Technology adoption cycle and that many of these bulbs could not be used with dimmers, didn’t give off a similar warm light that the incandescent bulbs provided (which my wife hated! ), and although the energy expenditure was less the early CFLs still left something to be desired. Enter the Lighting Prize (L Prize) by the U.S. Department of Energy (DoE). Wanting a Thomas Edison like transformation of illumination DoE set forth a challenge to competitively develop a new and exceptionally well crafted and tested LED light bulb. Philips was the lighting contest winner. They produced an exceptional product which is now known as the Philips 10-Watt Lighting Prize (L Prize) Award Winning 60-Watt LED Light Bulb. The L Prize Light Bulb appears to have corrected the major issues that I experienced with the early CFLs. 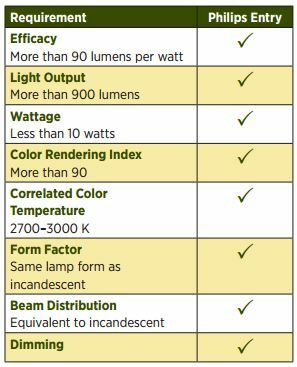 However the useful lifetime of more than 25,000 hours, compared with 1,000 to 3,000 hours for the incandescent products these highly efficient bulbs are intended to replace. 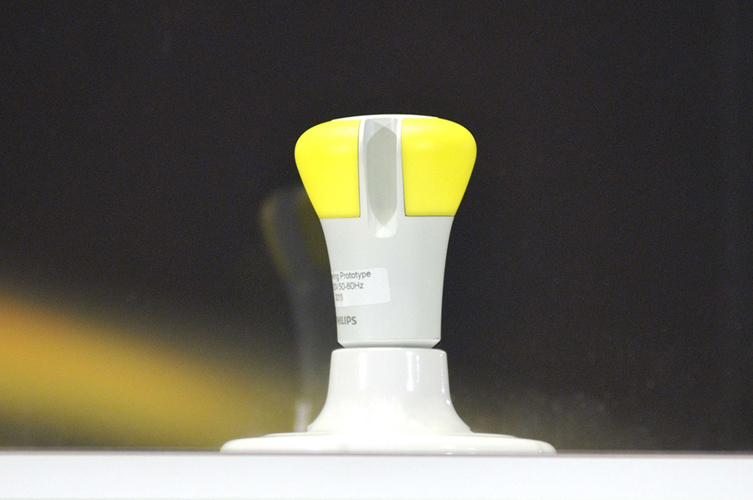 Yet the Philips L-Prize is still debuting as a $60 Philips light bulb. But even in the couple of months since the bulb’s announcement and release the price has dropped on average 10% and is near an average of $50 for the Philips Bulb. I’ve found the Philips 10-Watt L-Prize Award Winning 60-Watt LED Light Bulb in a couple key places; this will help you get the best deal! EFI ($49.95 + Shipping) Plus Check out their Product Rebates by State on the right side of their page. Don’t forget to fill out and send in this Rebate for an additional $10 off. 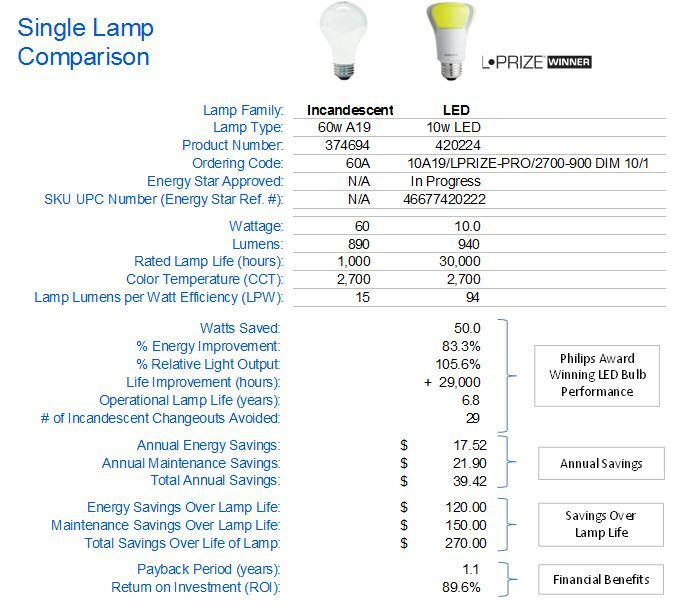 I ran a quick comparision of a 60 watt incandescent and the L-Prize Bulb. I’d with a few advantageous assumptions in the L Prize’s favor (made by their comparison tool) I’d recover the investment cost in approximately 1.1 years. Either way I’m looking forward to getting one and testing it out (and see if the wife notices any differences! ).